As you can see you can start your conversation with providing information which will help you to solve your issue faster or to increase sales. Your set of predefined responses can contain answers to most frequent questions your customers ask. However, when creating such responses make sure you use friendly language. If you misuse this feature, your conversation will sound unfriendly and your customers will think they are talking to a bot rather than to a human operator. Having such responses within easy reach will enhance and facilitate your support from one hand, but from the other hand they may sound robotic. We recommend that you personalize them before sending to your customers. 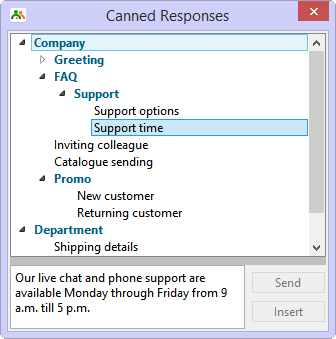 If you constantly run various promo campaigns and give special offers to different categories of customers, it may be really handy to add promo descriptions to your canned responses and quickly provide this information in chat. However, please make sure you have this information up to date. For such cases we suggest grouping your canned responses. You can have a separate group for your promo offers. In this case you will quickly find a response in this group and will not need to look for it among other responses. Definitely you have lots of links you need to provide to your customers. Such links can be, of course, saved as bookmarks in your browser. However, it will be much faster to create a group of canned responses which contains links to your YouTube videos, catalogs or presentations. The same can be applied to email addresses. Such links become clickable in your and customers’ chat windows after you send them. 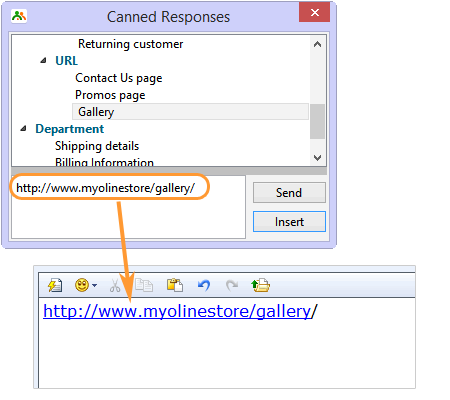 For training purposes you can add some standard phrases or set expressions to a separate group of canned responses. 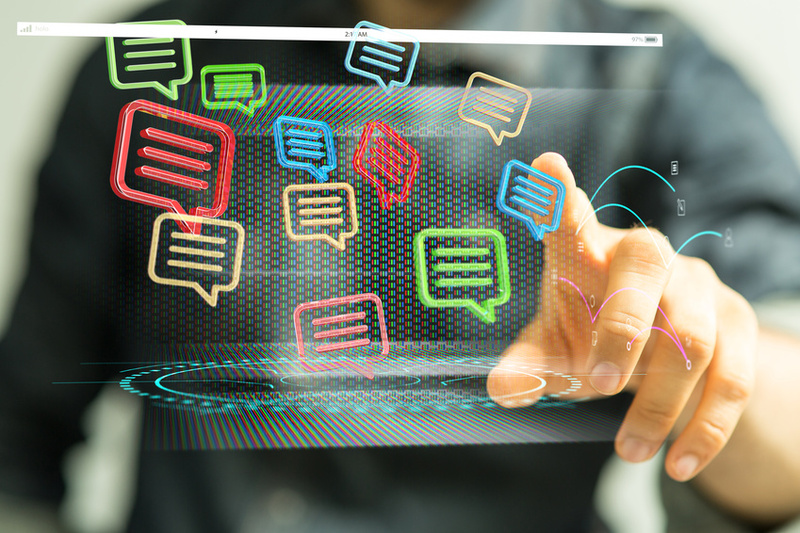 This will help your new live chat operators to choose right expressions. However, we do not recommend misusing this. As I have already mentioned before, this may sound robotic and unfriendly. The style of your conversation should be set from the very beginning taking into account your customer’s personality. 1. Giving negative news. Nobody likes delivering bad news. However, if you wrap them in positive statements, they will not sound that negative. 2. Handling angry customers. The best tactic in such situation is to show your sincere empathy and understanding, acknowledge the customer’s feelings. 3. Transferring a chat. Nobody likes to be transferred, so try to avoid such situations. 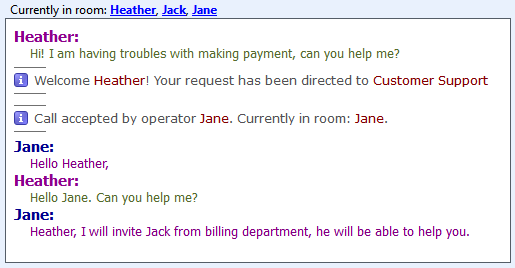 If it is necessary to transfer your chat, make sure you inform your customer in a polite manner. 4. If you need to say no. A simple “no” will sound rude. You need to choose positive expressions and use them while refusing your customer. 5. Putting on hold. It may happen that you need time to investigate the issue or search for additional details. In this case ask your customer for a permission to put on hold. 6. If you made a mistake. Just admit it, apologize and offer a solution. 7. Asking for more details. Make sure you understand your customer. This will save the time for both of you. If you have more examples and suggestions for using predefined responses, please share them in comments to this post. This entry was posted in Articles, Tips and Tricks, Tutorials and tagged canned responses, Canned responses examples, predefined responses. Bookmark the permalink.